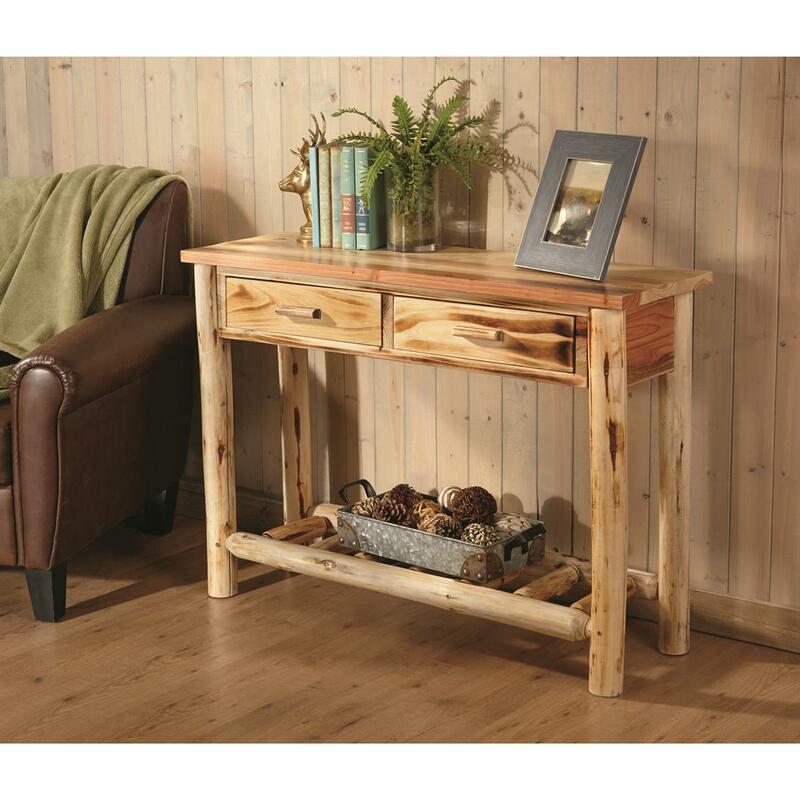 Enhance the look and function of your living space with solid, strong and sturdy wood log furniture. Pine logs are peeled and left with some partial bark for a truly unique and one-of-a-kind look. Exposed wood leaves the natural character and beauty of the log intact and provides a more rustic appearance. Clear, premium-grade lacquer has been applied to preserve a beautiful long-lasting finish. This ensures a truly heirloom-quality piece that will last for generations to come. Note: Log furniture is subject to the natural process of checking or splitting as the wood releases moisture. No compromise on strength, only builds character. 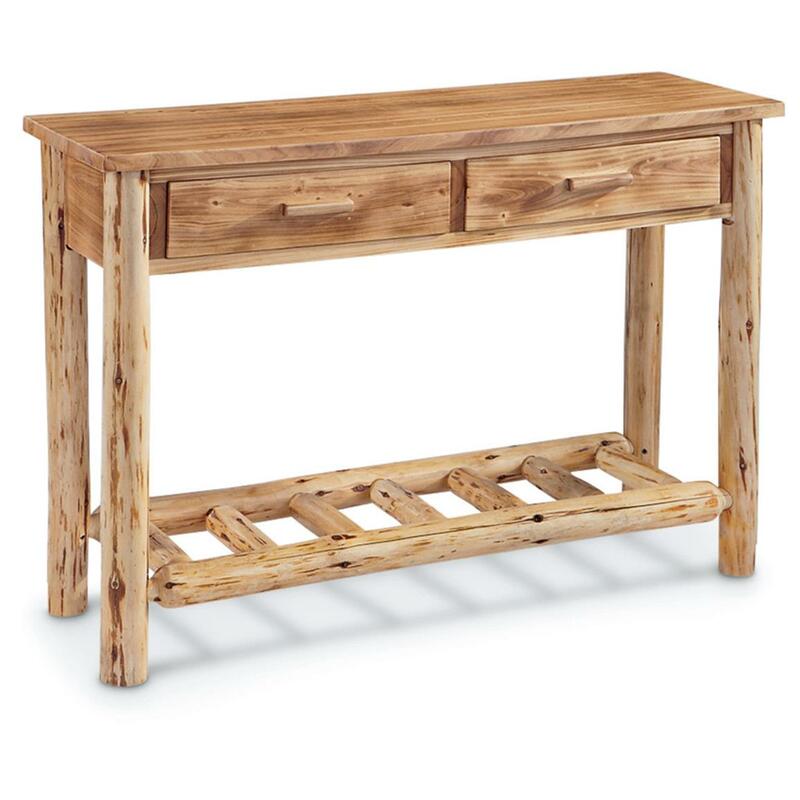 CASTLECREEK Log Sofa Table is rated 3.5 out of 5 by 4. Rated 2 out of 5 by MattH from Poor construction Poor construction, had to utilize other materials to assemble. Sideboards poorly stained, legs not cut at equal lengths. Made in China it that’s what you get now for lesser price. The stain pattern was decent but not what you would want for showcase furniture. Utilizing this for lamp stand behind bed so it will get minimum use as the drawers would not hold up to repetitive pulls. Rated 3 out of 5 by Buyer from Nice but had problems After completing assembly, I put in the drawers and found that one of the drawers was cracked across the front where the handle had been put on by the manufacturer. SG refused to replace the drawer unless I disassembled and returned the whole product. Rated 5 out of 5 by 1DOLPHWVA from GREAT TABLE A QUALITY LOG TABLE. EASY TO PUT TOGETHER. A FARE PRICE $$$$. MATCHES MY LOG BEDROOM SUITE PERFECTLY. Rated 4 out of 5 by Ed M from Looks great, better then expected.